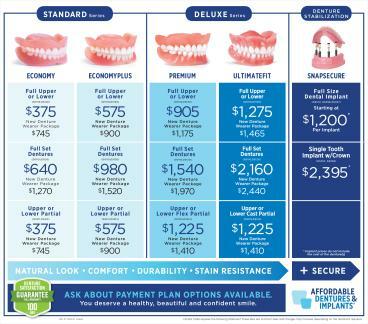 Affordable Dentures® is a practice that you can turn to when you're looking for a place where you'll be given compassionate care. We're dedicated to doing what's best for our patients who come to us from Miami Lakes and other areas. We'll show you why we're a leading provider of dentures in southeast Florida. Each person who seeks us out has a unique situation, and we work carefully as we treat each one of them. We aim to deliver your dental care with efficiency. To make sure we can do so, we've set up our office to include an on-site lab. Here, our skilled staff members can make new dentures and perform repairs to existing full-set or partial dentures. In many cases, we can provide same-day service. Handling everything within our practice allows us to offer services at affordable rates. When you step into our office in Miami Lakes, FL, you'll see how committed we are to serving people in our area. Our staff members are knowledgeable and caring, and we'll be able to answer any questions you may have. We focus on doing things the right way so that the positive effects of our work can be long-lasting. Contact us to learn more about how dentures could be the solution you've been hoping for.